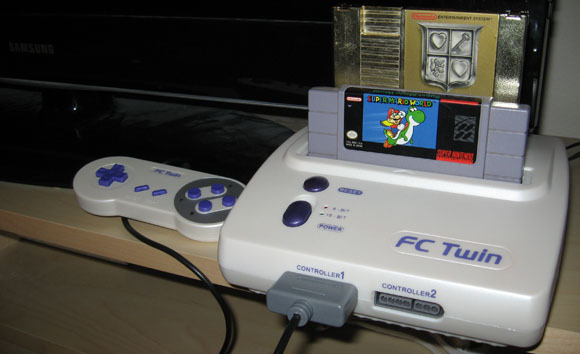 I got an awesome combo NES/SNES system for Christmas! It was totally unexpected, but I've been having a great time playing games on it. I guess they could be considered old school, but really they're just the games I grew up with. I was born in 86', so the NES and SNES were the most popular systems in my early gaming days. My brother and I owned both of them but we sold them we the shiny new N64 came out. It was one of the biggest mistakes of our childhood. He and I have talked about it over the years and this year he decided to do something about it. Not only did my awesome brother give me a duel retro system, he also picked up the original Legend of Zelda, Pilot Wings, Star Fox, and my favorite Mario game ever made, Super Mario World! It was the best Christmas present that I've gotten since we got our original SNES years ago. The amazing thing I'm finding out is how well these games hold up today. Graphics aside, the gameplay truly stands the test of time. I'm having just as much fun with them as I used to. There's no online connectivity, no achievements, no wireless controllers, and no HD signal... but it doesn't matter. The games are fun. And honestly, once you acquire a taste for 8-bit and 16-bit graphics they can truly be a thing of glory. My favorite game of the bunch is Super Mario World. It's a wonderfully crafted platformer and after all these years it may be the closest game to my heart. The graphical rendition of the 1-Up from Super Mario World is my all time favorite gaming icon. Don't believe me? Just look at the header of this blog. This has gotten me thinking. Are there any other NES/SNES games that I should buy if I get the chance? I didn't have an extensive library when I was younger, but I may start to build one up now. If you have any recommendations drop them in the comments below. I'm just happy I get to play Star Fox again. It's the first game I can remember playing, and my favorite childhood game. I had totally forgotten about Super Mario RPG! Thanks Tesh. I loved that game when it came out. I probably haven't thought about it in 15 years. I never did play the original Ogre Battle. That sounds intriguing. All of the others are classics and they're on my radar. Thanks for the suggestions. Ooh, seconding River City Ransom. That's a great game. Blaster Master is also a great NES game that sometimes gets overlooked in favor of the bigger titles. Secret of Evermore for the SNES is pretty good, too, if you start digging deeper into the library. It's not as good as Secret of Mana, but it's solid.